IDT Introduces New RF Amplifier with Superior Wide-Band and High Linearity Performance | Integrated Device Technology, Inc.
SAN JOSE, Calif., Dec. 5, 2018 /PRNewswire/ -- Integrated Device Technology, Inc. (IDT) (NASDAQ: IDTI), IDT today introduced its new F0424 high-gain broadband RF amplifier, which offers configurable high linearity performance at the lowest possible power consumption for a variety of receiver and transmitter applications operating between 600 MHz and 4200 MHz. The device offers the flexibility to tailor linearity performance to fit the needs of a wide range of applications and operates from a 3.3V or 5V supply. "The new IDT F0424 amplifier offers gallium arsenide-like broadband performance with the integration and configuration advantages and consistent performance of silicon over temperature and process, giving our customers a 'best of both worlds' solution," said Duncan Pilgrim, vice president and general manager of IDT's RF division. "The F0424 continues our tradition of providing high-performance RF solutions that meet the most demanding requirements of the wireless infrastructure, military communication and industrial equipment markets." The IDT® F0424 is an ideal solution for macro base stations, massive MIMO, repeaters, small cell and test equipment because it combines a flat gain across a wide spectrum with IDT's unique Zero Distortion technology, which dramatically reduces intermodulation distortion and significantly improves a receiver's signal-to-noise performance. The F4024 is available now in a 2 x 2 mm 8-DFN package. 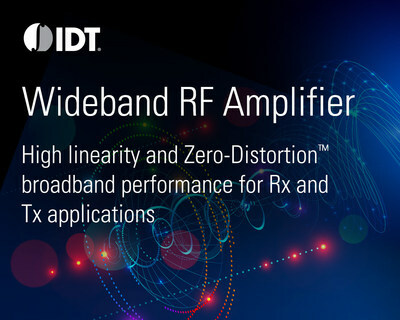 Read IDT's latest blog to learn more about the versatile, high-performance F4024 and visit idt.com/RF for more information on IDT's complete portfolio of innovative RF products and to request samples and evaluation kits.